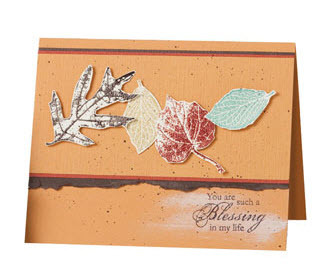 Create a bold backdrop for your card’s sentiment by sponging Whisper White craft ink across your card stock and then stamping the sentiment over it. Stamps: French Foliage, Blessings From Heaven. Paper: Early Espresso, More Mustard, Very Vanilla, Regals Collection Textured Cardstock. Ink: Baja Breeze, Cajun Craze, Early Espresso, River Rock, Whisper White, Versamark. Accessories: Clear Stampin’ Emboss Powder, Stampin’ Dimensionals®.